Satisfy your inner culture vulture at Sea Fortress Suomenlinna and Helsinki Cathedral. Shop till you drop at Market Square Kauppatori and Kamppi Shopping Centre. 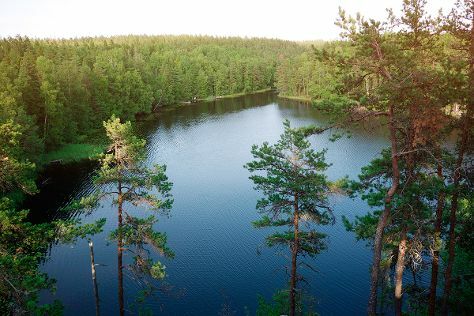 Change things up with a short trip to Nuuksio National Park in Espoo (about 46 minutes away). Pack the 8th (Mon) with family-friendly diversions at Linnanmaki Amusement Park. Next up on the itinerary: take in the architecture and atmosphere at Rock Church, admire nature's wide array of creatures at Korkeasaari Zoo, soothe aching muscles at some of the top local wellness centers, and contemplate in the serene atmosphere at Uspenskin Cathedral (Uspenskin Katedraali). For where to stay, reviews, traveler tips, and other tourist information, read Helsinki trip itinerary planning tool . If you are flying in from Norway, the closest major airport is Helsinki Vantaa Airport. In July, plan for daily highs up to 25°C, and evening lows to 15°C. Wrap up your sightseeing on the 11th (Thu) to allow time to travel back home.